Over the past decade geographers have shown a growing interest in 'the body' as an important co-ordinate of subjectivity and as a way of understanding further relationships between people, place and space. To date, however geographers have published little on what is one of, if not the, most important of all bodies - bodies that conceive, give birth and nurture other bodies. It is time that feminist, social, and cultural geographers contributed more to debates about maternal bodies. This book offers a series of windows on the ways in which maternal bodies influence, and are influenced by, social and spatial processes. Topics covered include women ‘coming out’ as pregnant at work, changing fashion for pregnant women, being disabled and pregnant, the politics of home versus hospital birth, breastfeeding practices that sit outside the norm, women who are constructed as ‘bad’ mothers, and ‘e-mums’ (mothers who go on-line). 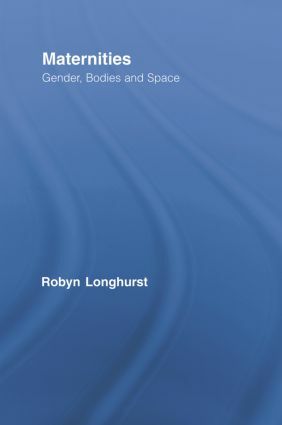 Robyn Longhurst is Professor of Geography at the University of Waikato New Zealand and is author of Bodies: Exploring Fluid Boundaries (2001) and co-author of Pleasure Zones: Bodies, Cities, Spaces (2001).